12 Climbing log entries Found. 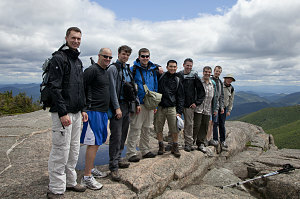 Our second "Twilight Hike" - this time on Cascade Mountain. An excellent peak when one wants relatively high open alpine terrain with a short approach. Originally this was planned as a morning outing, but the weather forecast dictated otherwise. We moved from Saturday morning to Sunday evening, departing from the Cascade Mountain trailhead shortly before 3pm. A brisk pace allowed us to reach the first lookout about ten minutes before sunset, where we were treated to a truly superb sea of undercast. Proceeding on to the bare summit, we enjoyed more incredible views of clouds below with the western Adirondack peaks poking through like volcanoes. An excellent addition to the annals of the ACC twilight hike series. 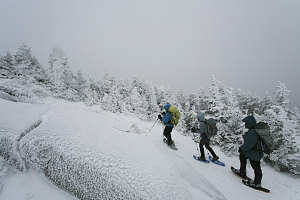 A beautiful pre-winter-solstice day on the best short traverse hike in the Adirondacks: The Porter-Cascade traverse. Everything went just right for us on this winter-season hike: just-below freezing temperatures, clear and calm skies, and a developing bit of interesting low cloud formations as the day progressed. Starting from the Marcy Field trailhead at 8:30 a.m., we followed a firm snowshoe track up the steeps to scenic Blueberry Mountain, then on up to the eastern end of Porter's ridgeline. A few snow-laden branches were the only real obstacles to an easy walk along the ridgeline to Porter's summit, where we noticed a buildup of clouds below us near South Meadows. Continuing on to Cascade, we encountered a beautiful snow-covered alpine stretch to the summit. Having only brought one car, we received a generous ride back from the hike's end to our start point by a fellow hiker named Noah. Definitely my best Cascade Mountain summit experience so far! 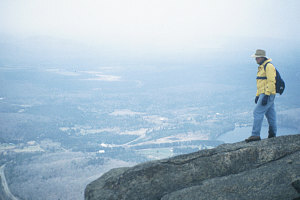 A summer-like hike on a late-winter day in the Adirondacks. The objective simple: a quick climb of Cascade and Porter from Cascade Pass. 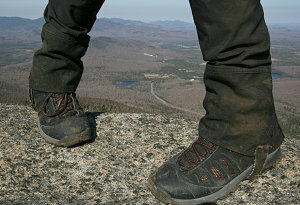 This hike was part of a larger weekend cabin stay in the Adirondacks - something unusual for us. We wanted a short hike to allow us spend some time doing other activities over the weekend. It was an extremely warm day for March 17, and the lower half of the trail was completely bare. 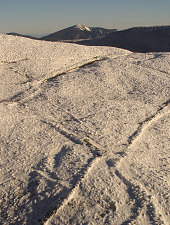 Higher up, a layer of melting hard-pack and ice necessitated traction aids. The summits of both Porter and Cascade both offered great views on this very warm but still very clear day. Usually an unusually warm day is accompanied by lots of haze and a reduction in clarity. This was not the case today. A team-building outing with my work group. 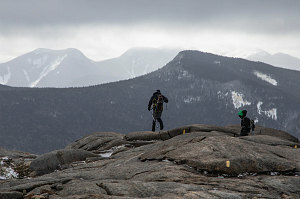 Thirteen people in total -- a big group -- and with some first-time adirondack hikers along for the ride, the prudent choice was something short but scenic: enter Cascade Mountain! With cool and mostly cloudy weather above, we started off at around 10am, made very good time for such a large group, and summitted right around noon. A cold frost the previous night meant no bugs, even down in the trees. A very welcome situation! Although the day was not clear, the cloud deck was high and not continuous. Views were not at all impacted, which is a good thing for a hike to such a nice summit as this one. After a summit lunch break, it was two more hours back down to the cars, for a total of roughly four and a half hours. Good job by all! Another intro hike for Miriam. Grew into something a little bigger and harder after we churned all the required parameters into the mix. We were seven in all: Luke, Sophie, Bob, Miriam, Asmir, Jenn, and myself. A glorious late summer day in the Adirondacks! We left a car at the Cascade Mtn trailhead and shuttled everyone down to Marcy Field, where we headed up the trail to Blueberry. Kept the pace nice and slow so as to promote enjoyment for all. Slabs and steep bits on Blueberry were fun, as usual. 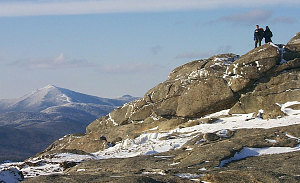 The big bald spot on the other side of Porter's summit was a scenic, if somewhat breezy and chilly, place to stop. One final major grind up to Porter's ridgecrest, and then we enjoyed the delightful little path that runs along the crest all the way to Porter's summit. 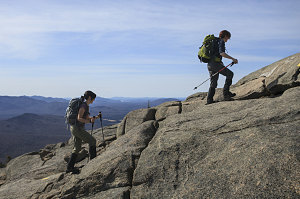 Weather continued to be great; couldn't ask for a better day to showcase one of the Adirondacks shorter fine hikes. After Porter, things got really busy, and the summit of Cascade was crawling with hikers! Filled out a survey on summit impacts from the University of Vermont -- interesting. Headed back down to catch up with compatriots and to get ahead and make progress on retrieving the far vehicle before everyone got down. Was pleased that Luke's feet didn't bother him too much and that all seemed to enjoy the hike! In addition to being a peak on Jenn's winter 46 list, we wanted to introduce our friends Scott and Phuong to the beauty of the Adirondacks in the winter. And, more than that, we wanted to get a little test hiking in with them before our upcoming Utah desert trip, which they were coming on with us this year. The weather looked like it was going to give us one of those 'socked-in' days, where the summits are solidly in the clouds. On the plus side, the temperature was forecast to be moderate and the winds not that strong. The trail conditions were very firm. In fact, there was very little snow base down low at the start - perhaps 6 inches at most. What was there was hard, and one could easily bareboot it with some traction aids. We took our time and headed leisurely up the pretty trail to Cascade Mountain. The clouds occasionally showed some hints of sunlight, but overall it stayed solidly clouded-in. Above treeline there was a moderate wind, but nothing too strong. The open bedrock of the summit was coated in the same ice we encountered earlier, and we had to be extra positive with our snowshoes' toe crampons in order to climb the little scrambly bits on the way to the summit. We were soon on the summit, and I congratulated Scott and Phuong on becoming 'winter 1ers', and Jenn on becoming a winter 42er. Jenn and I were now aligned: we both had the same four summits to finish for our winter 46: Marcy, Gray, Skylight and Haystack. With a chilly breeze and no views, we didn't dally long at the summit, and headed back down, using the buttsliding technique to get down the little scrambly bits. Soon we were back in the stillness and relative warmth of the trees, and it was a simple and short trek down the trail back to the car. See the image gallery link below for a more detailed writeup and the set of pictures. An ankle-testing hike (I had sprained it pretty badly a few weeks before). Day was cold but beautifully sunny. Took our time going up; saw suprisingly few people for such a nice day. Summit views were exceptional. Got back to the car around dusk. Ankle survived but still has a ways to go before being fully healed. 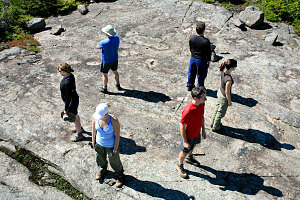 This hike came about after meeting a bunch of like-minded outdoors types on a Wilderness First Aid course that I took. We decided to do a point-to-point traverse of Porter and Cascade, a very pleasant route with lots of good lookouts and with one particularly nice summit (Cascade). Even though it was late March there had been a recent heavy snowfall and everything was very wintry. We started off from Marcy Field in clouds and light snow, but with still enough visibility to take in some good views on the way up Blueberry Peak. 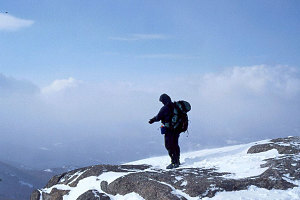 Once up on the ridge, snow conditions were great for fast and easy snowshoeing. The weather steadily improved and by the time we reached porter it was a mostly clear late winter day (although even though these were clearly winter conditions it technically NOT a winter hike, since it was now spring). A final stop on the very nice open summit of Cascade and then it was down the steep stuff to the Cascade mountain trailhead before it got too dark. Peter and I did this hike as part of our training for Rainier. We wanted to get some wintry conditions under our belt for the upcoming summer climb. We rented/borrowed snowshoes and hiked up from the Cascade mountain trailhead. Weather was clouds mixed with sun and lots of wind - gave things a good winter-adventure feel. We did Porter's summit first and then returned and did Cascade. Cascade is really such a nice summit for so little distance! This was the hike where I introduced Luke to the Adirondacks. We did this hike as a point-to-point (which is the only reasonable way to do this). As I mention in another trip report, this route is very nice with lots of different lookouts in different directions all along the way. I recall Billy and I investigating some cool ice formations on the way up Blueberry, even though it was May. The other thing I recall vividly about this hike is that Luke's feet ended up killing him. By the time he got to Porter he was quite uncomfortable and by Cascade's summit he was in severe pain. Weather was so-so with limited views into the still-snowy high peaks. I think Luke's feet problems combined with a fairly long hike conspired to turn him off of hiking with us for quite a while.